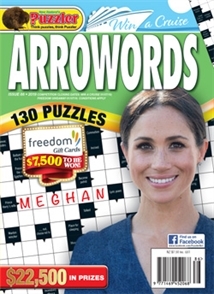 If arroword puzzles are your pleasure, Arrowords gives you 130 reasons to be happy. And thanks to the massive variety of puzzles on offer, you can be sure that your puzzling experience will never become stale. For pop culture buffs, there are plenty of celebrity, movie and TV themed puzzles to keep you guessing, as well as amusing quotations to decipher, fiendish quiz questions to solve, and interesting links to discover between pictured stars. The sizes and shapes of the puzzle grids vary, too, from long and thin Tall Boys, to pyramids and double-page teasers. And with a great prize competition in each issue, if you're looking for the best in puzzles… just follow the arrows!